The SAM Fast Track Air Hockey table is the top of its range and suitable for both family and friends. The table incoorporates mirror steel playfield, lively score commentary and an engineered top rail that angles the puck for safer game play. 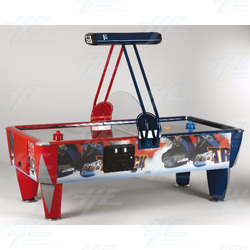 This machine also comes with an added safety screen for enthusiastic players, variable speed pucks for younger players and the option to shorten the legs.